Although its release is only expected to happen in June, we've been seeing quite a few leaks regarding the OnePlus 6 recently. Add to that the fact that you can no longer buy the OnePlus 5T in the US, and we're left wondering: has the Chinese company decided to out its next flagship smartphone sooner than initially planned? While we don't know that yet, we can show you another image of the phone. Here it is showing off a very interesting texture on its back, in a shot that comes courtesy of Evan Blass (a.k.a. @evleaks). The design fits with what we saw from a purported hands-on back in February, yet that woodgrain texture wasn't there then. 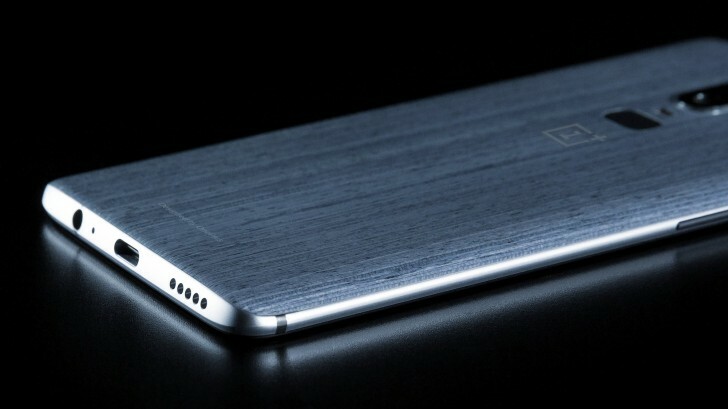 This could simply be a skin applied on top of the handset's rumored glass rear, but then why are the words "Designed by OnePlus" etched onto it? Is OnePlus getting into the 'pre-applied skin' business? Perhaps the company will simply market more than one variation of the device, so those who love the feel of a glass back will get one, and the people who would rather have some texture and grippiness will be catered too as well. We'll have to wait and see how this pans out. No further details have accompanied today's leak, but we can obviously discern a 3.5mm headset jack on the bottom next to the USB-C port and speaker. The fingerprint scanner is on the back underneath the vertically aligned dual camera setup that's centered and not off to the left, so props to OnePlus for not adopting that iPhone X-inspired look. The OnePlus 6 will be powered by Qualcomm's Snapdragon 845, paired with 6GB of RAM and 128GB of storage. Its touchscreen will be notched a la the Oppo R15. It will run Android 8.1 Oreo. Its dual rear cameras are to have 20 MP + 16 MP resolution, both sensors with f/1.7 aperture. Selfies will be taken care of by a 20 MP f/2.0 shooter, and the phone will be kept chugging along by a 3,450 mAh battery. These are the specs that leaked a few days ago. Hopefully your explanation gets thru to them. Don't try too hard. Some people are just trolling and has no intention of learning nor even having a proper discussion. They are a waste of your time.